April 1865. "Richmond, Virginia. Destroyed Richmond & Petersburg locomotive." 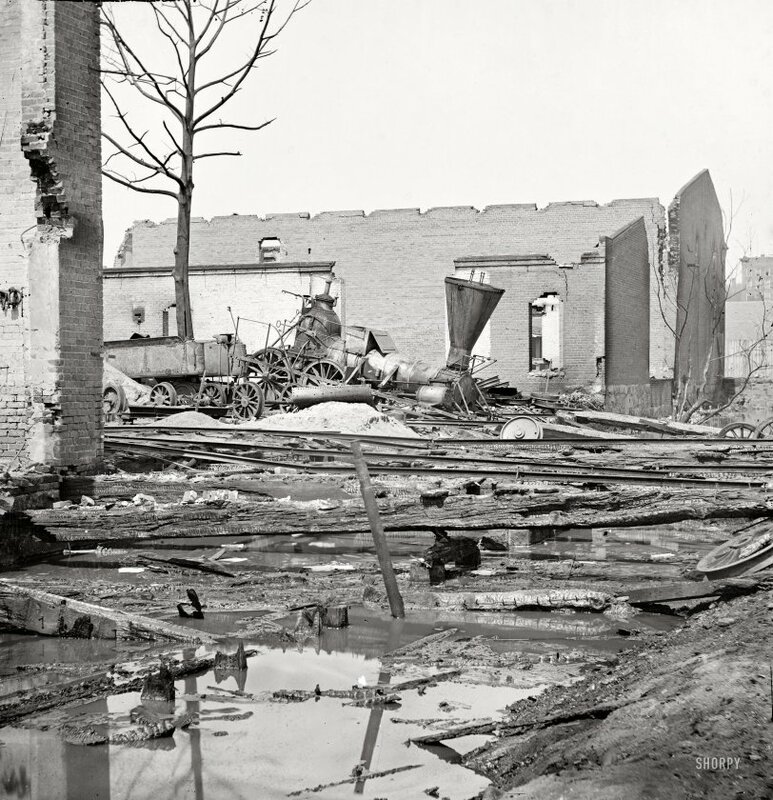 Aftermath of the Confederate evacuation in which Richmond's business district, accidentally torched by its own citizens, burned to the ground, the flames extinguished only with the aid of the occupying Federal Army. View full size. Submitted by philipmartin on Sat, 02/18/2012 - 4:27pm. That loco looks like a fugitive from the scrap heap by Civil War times. It probably dates from the 1840's judging by that upright boiler. Not exactly a main line engine anymore. Light rail - light rolling stock. Submitted by z396z28 on Mon, 02/06/2012 - 9:46am. Look at the light-weight rail used back in Civil War times. Submitted by Dennis M on Sun, 02/05/2012 - 6:47pm. Looking at this picture I have to wonder about the uses all that scrap metal was put to during reconstruction. Submitted by Bolek on Sun, 02/05/2012 - 4:34pm. Building on the right side looks so modern. Windows and the flat roof. Impressing. Submitted by Hawk777 on Mon, 02/06/2012 - 9:51pm. And just how do you mistakenly torch one of your cities and not theirs? Actually this is a great pic simply because one can clearly see the internal components of this steam locomotive. And yes, the building in the background would have had elevators-steam elevators probably.